Name: Anatolio Acrylic Modern Freestanding Soaking Bathtub 69"
This oval acrylic modern bathtub comes fully equipped with an over flow, pop-up and drain. A thick sided elliptical shape will immediately provide a sense of comfort as you feel the strong silhouette cradling you with complete relaxation and bliss. The smooth curved lines incorporate the perfect form that is attributed to modern acrylic bathroom design while proving functionality in your bathroom home d?cor. Implementing flawless freestanding bathtub design and unsurpassed trendy elements while bringing an elegant appeal throughout your bathroom setting. 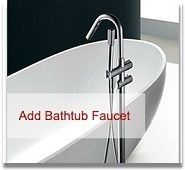 The Anatolio freestanding bathtub will offer a high end luxury look while its ensuring absolute harmony and relaxation.